Lets set the scene..You are rolling out hundreds of PCs with Windows 7 and you want all the agents preinstalled..naturally. Well the AppSense Environment Manager Agent is no exception. Here are a couple of reg mods I do in my imaging process. I clear the AppSense “MachineID” value to avoid duplicate entries in my database and I force the “GroupID” to ensure my client appears in the correct deployment group in my management console. I get the GroupID by checking the registry of a machine I have manually moved to my deployment group. I think that just about covers it. Back to my cuppa. Great post, what happens if a machine is already present in a previous AppSense group? Does it need to be removed upfront? Also to note, as per the Management Centre Guide, “If a computer matches multiple membership conditions in different Deployment Groups, it is added to the first Deployment Group in the list where a membership condition matches” – “Membership Rules are processed in the order the Deployment Groups are listed in the Membership Rules work area”. Thanks for your quick reply, I ask this because I’m currently working on a project where we have multiple groups, and due to the fact that the AppSense Com agent needs to be upgraded, and a different group is attached. We are forced to remove the current entry of the client from the back-end. Therefore my question was, if we’d specify the new group, it will automatically be added (or moved) to the new group. At this moment I think our issue what we had has been resolved, but I was just curious to know what your opinion and experiences where. Ah, forgive me. I misunderstood. 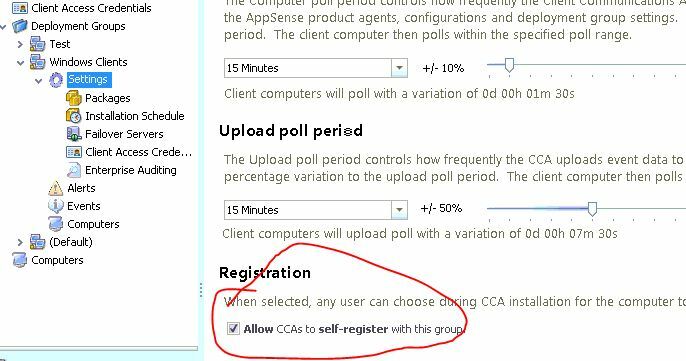 Unless I am mistaken, updating the “group id” registry key manually once the CCA has already joined a group would be pointless because at the next poll period specified by the deployment group that reg key gets updated with the group id corresponding to the deployment group it is already a member of. There are only 2 ways I can think to do this. 1. Right click the computer in the management console and choose “Move” (a little tiring with hundreds of computers). 2. Un-register the computers from the existing deployment group, remove the reg key locally from the PC “HKEY_LOCAL_MACHINE\Software\AppSense Technologies\Communications Agent” “group id” and then restart the CCA. Ensure you have a membership rule in place that would allow the computer to rejoin your new deployment group. You raised an interesting point though Rens. I am going to play with this a little more. My basic understanding at the moment is that once a computer has joined a deployment group, it will not dynamically change groups even if a new deployment group membership rule is met. I’d be interested in what @AppSense support say. Again thanks for the reply. I agree with your solution. In the case we are using it at this moment, AppSense has provided us a script which we need to call during our (re)deployment of machines, and our upgrade task sequence (we service existing and new machines with SCCM) The script calls the backend of AppSense to query for a computer object which meets the hostname already available in the backend and deletes this entry from the group/backend. So the newly installed or upgraded machine can join a different group, which is specified in our task sequence. The reason why is a bit devious, since AppSense does not provide a mechanism on the backend that if a machine meets certain rules, it will automatically be moved to a new group. In this case it was necessary because we have upgraded our AppSense agents, and the clients with the new agents have a different AppSense configuration then the older ones. This is/was the initial reason for my question. Perhaps you have any suggestion, or can elaborate on how you would approach a situation like this. Many thanks again! Cheers mater! AppSense Start Menu /Taskbar Icon and Toolbar Personalization for Windows 7 – To Hive or not to Hive?